From Moses to Gutenberg, easily find out how we got the Bible we have today and discover why we can trust it with this highly-visual and easy-to-understand handbook on the history of Bible! Dive into the fascinating stories of the people who risked their lives to print and distribute the Word of God (Tyndale, Wycliffe, etc). Perfect for personal or small group use. Have you ever wondered where the Bible came from? Who wrote the books of the Bible and how did they end up together? Perhaps you have been asked by a friend or coworker about books that were cut out of the Bible. Through seven dynamic chapters in How We Got the Bible, expert Dr. Timothy Paul Jones will guide you through all the important questions about the Holy Bible to show you why it can be trusted. Filled with dramatic stories and highly-visual charts and illustrations, this exciting Bible History handbook will take you from the earliest clay tablets and papyrus copies to the first bound Bible and the various Bible translations that we use today! 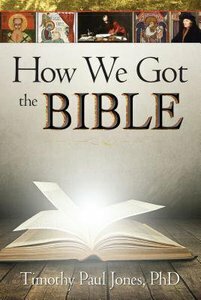 About "How We Got the Bible"
Timothy Paul Jones (Ed.D., Southern Baptist Theological Seminary) is senior pastor of First Baptist Church of Rolling Hills in Tulsa, Oklahoma. He is the author of Finding God in a Galaxy Far, Far Away; Praying like the Jew, Jesus; Answers to the Da Vinci Code; Prayers Jesus Prayed, Christian History Made Easy and with James Garlow and April Williams, the bestselling The Da Vinci Codebreaker. Dr. Timothy Paul Jones, has accepted an appointment as a professor of leadership and church ministry at The Southern Baptist Theological Seminary in Louisville, Kentucky.